Still wondering if eating high protein low fat venison meat is cut out for your diet? There is no comparison to deer meat in terms of nutrition. While you are wondering how to get the taste of gamey meats out of your mouth, you are probably wondering about is deer meat healthy or not. Here we compare venison nutrition with that of beef, pork, and chicken just to give you a good idea about how good deer meat is for you. When it comes to meats, deer meet is said to be high in nutritional value. That is to say that when compared to beef, pork, and chicken it is a superior source of nutrition as you will soon find out in terms macronutrient composition (protein, carbohydrate, fat), iron, and vitamin B2 while being relatively low in calories. The table below compares beef shoulder roast, roasted pork shoulder, and chicken breast meat in terms of nutritional value. For pork and beef, the values listed in the table or for low fat red meat. Note that although chicken breast may lack in vitamins and minerals, it is unarguably one of the most suited foods to start thinking about when thinking about going on a high protein low calorie diet. Venison is high in iron which is good for iron deficiency anemia prevention and vitamin B2 to speed up your fat burning metabolism. Eating deer meat while pregnant may help get over an iron deficiency given that the venison you are eating is properly handled and cured to eliminating any chance of coming across foodborne illnesses. Deer meat is an excellent source of polyunsaturated fatty acid with 8.9g of linoleic acid, 4.6g of alpha linoleic acid, and 0.5g of docosahexaenoic acid (DHA). Although DHA is primarily found in natural food sources such as blue backed fish like the Japanese sardine and is rarely seen in meat such as beef and pork, venison has it. As you know DHA may help reduce triglyceride levels in your blood, which means less fat being transported to fat stores making it easier to keep your body fat down to a respectable amount. Deer meat as you know is no different from wild animal meat like that of a wild boar. One thing that rises to the surface when talking about eating wild game is the gamey smell. Due to the fact that deer meat is relatively low in fat, the smell shouldn't be that bad. Nevertheless many would agree no matter how you smell it, the gamey smell never ceases to scape your mind as your brain tells you that it's wild game meat. Low fat in deer meat makes it look and taste dry compared to beef and pork with considerably higher fat content. Some people even go as far as to say that it is hard to chew not just dry like jerky. To make venison meat more edible in places where it is commercially available, the gamey smell in deer meat is removed replacing it with something less gamey. Note that depending on how deer is cooked, its gamey smell can easily be removed. The easiest place to buy deer meat or any other type of wild game meat is as you would've guessed the Internet. How else do you expect to put wild animal meat in your hands without going out hunting? - Note that depend on the availability in your area, you might have some luck looking around your locale butcher's shop or restaurant nearby. One advantage of choosing to buy canned deer meat versus raw deer meat is that it has its gamey smell removed to better fit the taste preference of the customer. For people not well adjusted to the gamey smell in wild game meat such as venison, canned deer meat is highly recommended. 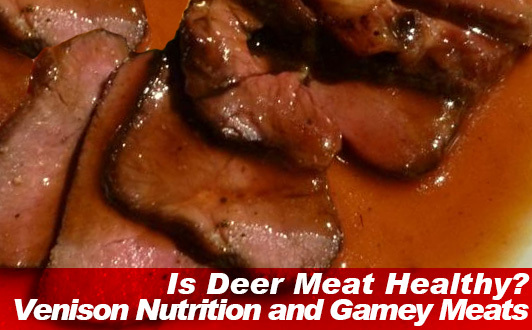 It turns out there are all kinds of ways to remove the gamey smell from deer meat. To be more particular, there is a method using yogurt you ought to try out sometime. Soak or otherwise marinate in yogurt for 20-30 minutes. This will not only get rid of the gamey smell in venison but also give you more tender deer meat. However, for people just getting started out making their first dish featuring deer meat adding a little seasoning to cover up the gamey smell may be what you are looking for. Can you eat venison rare? People choosing to eat deer meat raw similar to the way Japanese-sashimi is eating, beware! - As popular as eating raw deer meat is in the circles of people head over heels eating sashimi like popcorn chicken, eating deer meat raw can sometimes lead to food poisoning, which is why eating deer meat exposed to heat is recommended.